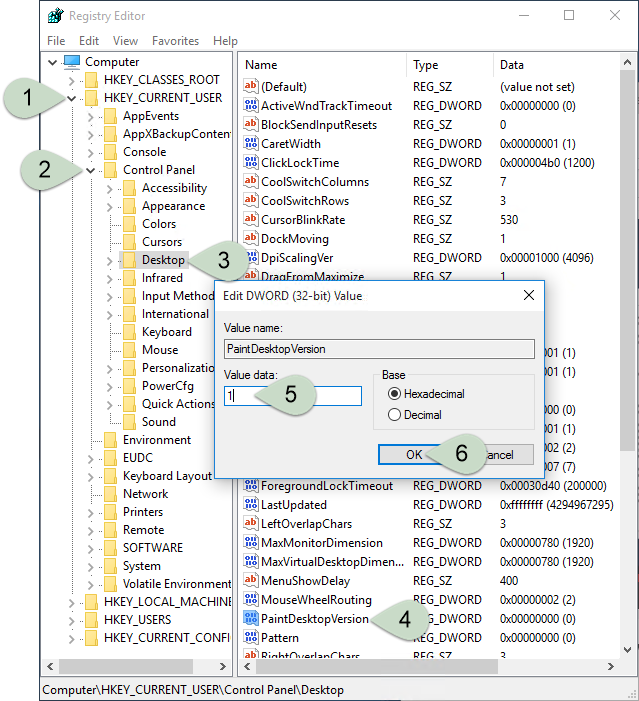 Here's the 6 steps in regedit.exe, then just logoff/logon [or restart Windows Explorer using Task Manager Processes view]. You're done! During the Windows Insider Preview period, essentially was public beta test of Windows 10, Microsoft wisely chose to show the version of Windows and the Build Number on the desktop. Helped us keep things straight. Kind of like a lite version of the sysadmin's beloved BgInfo. But once Build 10240 was released, the "GA" or release version of Windows 10, they took that nifty version display feature away. You can get it back again! The very short video and written procedure below show you exactly how, with the change taking effect immediately. That's right, no log off required. I really like this tweak for my VMs and home lab, especially handy when a system or VM hasn't been used in a while. Now I know at a glance what I'm looking at, before Windows Update has had a chance to catch up. Editing the registry carries some danger, and requires administrative rights. This is done at your own risk. Only proceed with this if you're comfortable with backing up and restoring your registry keys, if needed, as explained by Microsoft here. Step-by-step, left-click shows red, right-click shows blue. You can pause at any time. Click the audio control to unmute, if you want to hear the mouse clicks. This video steps you through the entire tweak procedure, with an explanatory voiceover. You're still here, looking for words? Here you go. That's it, you should now see the Windows version painted on your lovely Windows 10 desktop, from here forward. Enjoy! First, a screenshot of how the bottom right corner of your desktop looks before the upgrade. After the upgrade and the registry tweak, your desktop will show as Build 16299.rs3_release.170928-1534. How to show Windows 10 version and build number on your desktop, also works with Creators Update Versions 1703 and 1709!